Trooping the Colour is an annual event which marks the sovereign’s official birthday. The ceremony is thought to have begun in 1748 and in the twentieth century it has been fixed as a June event. This happens irrespective of the sovereign’s actual birthday in the hope that the weather will be better in June than at other times of the year. Although the Queen’s actual birthday was on 21 April, Trooping the Colour takes place this Saturday 15th June at Horse Guards Parade. The event is a military ceremony, where colours (flags) are carried (or ‘trooped’) down the ranks of assembled soldiers. The idea behind this was originally to ensure that troops would recognise their own battalion’s flag during battle. The event has traditionally drawn huge crowds and so it features in numerous Underground posters. The colourful spectacle has been an inspiration to several poster designers. In this fine example from our current exhibition, Poster Art 150, artist Margaret Calkin James interprets this historic event in her characteristic style of exaggerated colour with simplified and repeated forms. The arches of Horse Guards Parade can be seen behind the soldiers. 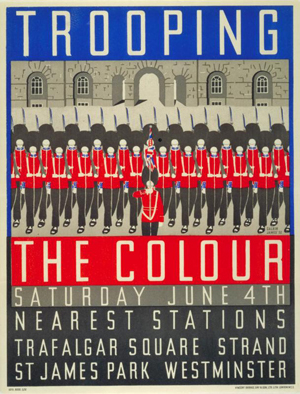 Really like how the typography in this poster seems to mimic the soldiers – very regimented!